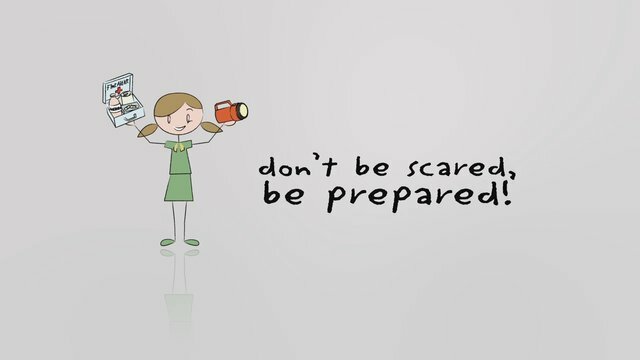 Mommy Tots: What to put in Emergency Preparedness Kit and Go Bag? What to put in Emergency Preparedness Kit and Go Bag? Eight years ago, we personally experience to evacuate due to knee level flood that stays at home for 6 weeks. Thankfully, we managed to moved at my SIL's home as soon as we secure our appliances and personal belongings. I never knew that we are living in a flood prone area until tropical storm 'Ketsana' hits our place. And then 3 years later, heavy rains brought by Southwest Monsoon Habagat forced us to evacuate again. Typhoon Ketsana was my first devastating encounter with floods. When I'm still living with my parents we weren't directly affected with any storm. Year 2013 when we moved in to our new home that wasn't prone to floods, and the year when deadliest Typhoon Haiyan hits our country. Those experiences made me realized the importance of preparedness and being ready to response to natural or man-made disasters. That is why its a must to have Emergency Preparedness kit and a Go-bag that won't let us down when disaster strikes. Alcohol, betadine, plasters, bandages, gauze pad, cotton, surgical tape, and scissors. Make sure to include a battery powered flashlight with extra batteries, battery operated AM Radio transistor, power banks, lighter and whistle. Have an emergency food available in your pantry, like My Patriot Supply, it's a 72-hour food supply packaged into smaller packets inside a large pack that contains 4 Servings Potato Soup, 4 Servings Creamy Chicken and Rice and 8 Servings Oatmeal. My Patriot Supply focus on quality and affordable products that have been personally tested and approved by Matt Redhawk and his loyal staff. Also, stock up crackers and easy to open canned goods. List down expiry dates to easily check when it should be replaced. Toilet paper, baby wipes, shampoo, anti-bacterial soap, toothbrush, toothpaste and sanitary pads. This should come in handy! it pays to know which ones to call during emergencies. It is best to keep those contact numbers not only on mobile phones but on a piece of paper as well. Actually contains the items listed above plus the raincoats, jackets, blankets, and umbrella. Emergency preparedness must also comes with evacuation preparedness. They call it life bag, life pack, etc., it's a bag that contains items that will make you survive for the first 72 hours of evacuating from a disaster. Have it regularly check and update the contents of your Emergency Life bag to ensure readiness at all times. I prefer having a separate stock for our Emergency Kit and a Life Bag. We are a family of four, so its best to have a bag for each member and let the kids be aware of their own kits. Make sure that all family members know where the emergency kits and life bags are kept. I let the kids prepare their own life bag and educate them of possible scenarios that can happen when disaster strikes. This is a good way to train them to be self-reliant and make safety and preparedness a part of everyday life. I have to include this one as we recently had terror attacks that made the government declare martial law at entire Mindanao Region. Store and secure your valuable possessions like important family documents, bank records, insurance, jewelries, collectibles and other valuable items. This is our long overdue must have item in the house, we often disregard the need of having this one due to its hefty price, but vowed to prioritize this item to be bought this year. The list only consist of basic items, once we are done with the basics; we can start to add up our family's unique needs such as special medication or baby items. How about you? What's in your Emergency Kit and Go Bag? Feel free to comment down the items that I might missed to include on the list. I have been meaning to put together and emergency kit. Living in Chandler, AZ we don't get many natural disasters but that doesn't mean we shouldn't be prepared for other possible issues. Thank you so much for sharing this helpful information. I do have a first aid kit in my car that includes a heat blanket and purified water. Having grown up in NY blankets, shovels and the such were important in the winter. I have some a go-bag but definitely haven't updated it in a while! I'm going to add some of these suggestions! This is an excellent list of resources. It's so important to be prepared and I think all the disasters we've had the past few years have made people more aware of the need. Wow. This is so important. My family and I went through tornadoes in Central Florida in 1998 and learned so much from the sad experience. We were just hit by Irma this year and agree with you preparation is essential. We have a similar emergency box - more for in case of cyclones, fires or flooding. It is something that was instilled in me as a child and something that I have carried with me wherever I have lived.